Punjab Waqf Board has recently given notification of 12 Legal Support Officer, Assistant Programmer, Accountant, and other Vacancies. You can apply for the Punjab Waqf Board Recruitment 2019 on or before 20.02.2019. Waqf Board Punjab Recruitment 2019-20 latest notification is out. As per the Notification, there are 12 Legal Support Officer, Assistant Programmer, Accountant, and other Vacancies. The educational qualification is the BCA and LL.B degree. The maximum age limit is as per the Waqf Board rules. If you are looking for Jobs in Wakf Board Punjab then this article is going to be very helpful for you. Name of Department: Punjab Waqf Board. Assistant Programmer: BCA or equivalent with at least 02-years of experience. Legal Support Officer: A Law Graduate with at least 05-years of experience in the Legal Matters. Legal Support Assistant: A Law Graduate with at least 02-years of experience in the Legal Matters. Zonal Waqf Officer: The Officer retired from Central Govt./ State Govt./ PSU or equivalent having vided administrative experience or should have a graduation degree in any discipline with at least 05-years of experience. Survey Assistant: The candidate should be a retired Officer or Surveyor from a similar department having field works experience. OR graduation in any discipline having a similar experience of at least 05-years. The maximum age limit is as per the wakf board rules. You can send your application through speed post or in person to the Chief Executive Officer, Punjab Waqf Board, SCO 1062-63, Sector 22-B, Chandigarh in the prescribed application form (along with the resume and documents) on or before 20.02.2019. You can check the Punjab Wakf Board Result or Interview List from the official website. Punjab Waqf Board has recently given notification of 10 Legal Support Officer, Assistant Programmer, Accountant, and other Vacancies. You can apply for the Punjab Waqf Board Recruitment 2018 within 15 days from the date of advertisement. Waqf Board Punjab Recruitment 2018-19 latest notification is out. As per the Notification, there are 10 Legal Support Officer, Assistant Programmer, Accountant, and other Vacancies. The educational qualification is the diploma and graduation degree. The maximum age limit is as per the Waqf Board rules. If you are looking for Jobs in Wakf Board Punjab then this article is going to be very helpful for you. Assistant Programmer: Diploma in Computer Science/ BCA or equivalent from a recognized university with minimum 02-years of experience. The candidate should have a typing speed of 30-40 words per minute. Legal Support Officer: An advocate having at least 05-years of experience in the legal matters. The candidate should have good verbal and written communication skills in English. The candidate should have a typing speed of 30-40 words per minute. Accountant: B.Com with at least 03-years of experience in Accounts and Tally. The candidate should have good verbal and written communication skills in English. The candidate should have a typing speed of 30-40 words per minute. Zonal Waqf Officer: The Officer retired from Central Govt./ State Govt./ PSU or equivalent having vided administrative experience or should have a graduation degree in any discipline with at least 05-years of experience. The candidate should have good verbal and written communication skills in English. The candidate should have a typing speed of 30-40 words per minute. Survey Assistant: The candidate should be a retired Officer or Surveyor from a similar department having field works experience. OR graduation in any discipline having a similar experience of at least 05-years. The candidate should have good verbal and written communication skills in English. The candidate should have a typing speed of 30-40 words per minute. You can send your application within 15 days from the date of advertisement through registered/ speed post to the Chief Executive Officer, Punjab Waqf Board, SCO 1062-63, Sector 22-B, Chandigarh. 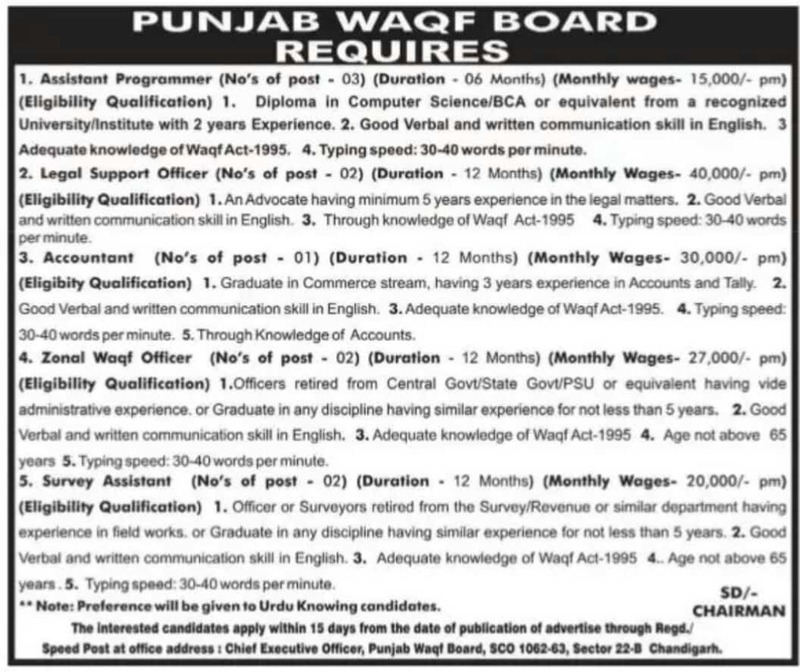 Punjab Waqf Board (PWB) has given a notification of 10 Legal Support Officer, Accountant, Zonal Officer, Survey Assistant and Assistant Programmer Vacancies on a temporary basis for the period of 12 months. The interested candidates can apply for Punjab Waqf Board Recruitment 2018 within 20 days from the date of advertisement. Wakf Board Punjab Recruitment 2018-19 notification is out. As per the Notification, there are 10 Legal Support Officer, One Accountant, Zonal Officer, Survey Assistant and Assistant Programmer Vacancies. The educational qualification is graduation. The age limit is as per the board rules. If you are looking for Jobs in Punjab Waqf Board then this article is very helpful for you. Legal Support Officer The candidate must be an advocate having 05-years of experience in the legal matters. Accountant Graduation in commerce with 03-years of experience in accounts and tally. Zonal Officer The candidate should be an officer retired from Central Govt./State Govt./PSU or equivalent having vide administrative experience or graduate in any discipline with at least 05-years of experience. Survey Assistant Officer or Surveyor retired from the Survey/Revenue or similar department having experience in field work or graduate in any discipline with at least 05-years of experience. Assistant Programmer Diploma in Computer Science/BCA or equivalent qualification with 02-years of experience. Note: The candidates should have good verbal and written communication skills in English and adequate knowledge of Waqf Act-1995. The candidates should also have the typing speed of 30-40 words per minute and good knowledge of Urdu. If you are interested in this job then you may apply within 20 days from the date of advertisement of this notification in the newspaper and through office mail ID: ceo.pwb@gmail.com. Last Date: Within 20 days from the date of publication of advertisement. 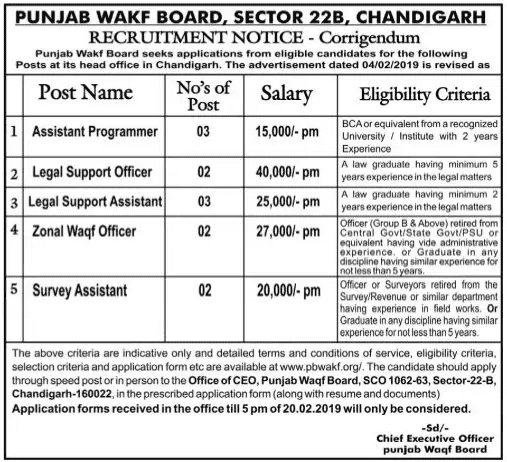 Punjab Waqf Board (PWB), Chandigarh has given a notification for the recruitment of Full-Time Chief Executive Officer (CEO) Vacancy on the deputation basis for three years. Who shall be a Muslim and shall be appointed by the State Government. The interested candidates can apply for Punjab Waqf Board Recruitment 2018 on or before 10 February 2018. Wakf Board Punjab Vacancy 2018 – 19 notification is out. As per the Notification, there is one Full-Time Chief Executive Officer Vacancy. The educational qualification is graduation degree preferably in law. The age limit is 30 to 62 years. If you are looking for jobs in Punjab Wakf Board Chandigarh then this article is only for you. In case of non-availability of a Muslim officer of the rank, a Muslim Officer of equivalent rank or higher rank will be appointed on deputation basis from another state/central government. The officer retired from the equivalent rank or higher can also apply. The candidate must hold a bachelors degree (Graduation) preferably in Law from any recognized university. 30 years to 62 years. The pay scale, other emoluments and terms & conditions of the appointment shall be governed u/s 23 of Wakf Act, 1955 (as amended in 2013) and Rule 8 of Punjab Waqf rules, 1964 subjected to modifications made by the state government to such rules. You can send your applications along with the bio-data should reach to the Chairman, Punjab Waqf Board through email (ceo.pwb@gmail.com) or by registered post up to 10.02.2018. Last Date: 10 February 2018. Punjab Waqf Board SCO No. 1062-63, Sector 22-B, Chandigarh. Harmeet Singh Educational Qualification 10+2,Graduation(pbi Patiala),E.T.T and computer diploma.I am interested in this ceo post for applied.